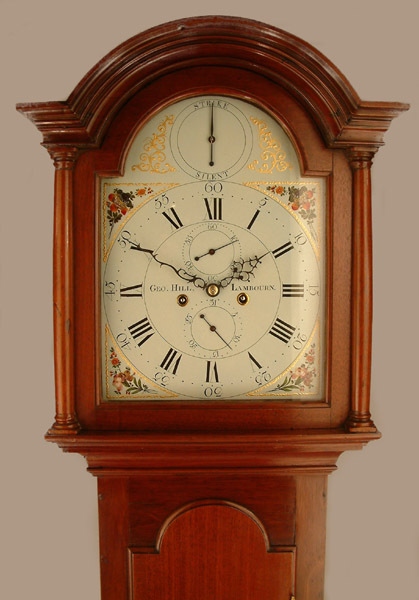 George Hill of Lambourn Longcase Mahogany Circa 1785 - Height 76.5in. This Longcase Mahogany Archive's Maker - Geo ( George ) Hill of Lambourn recorded "about 1770". Please see below information regarding the clock above. A particularly small, neat, pretty, "country mahogany" case with long door and breakarch top. 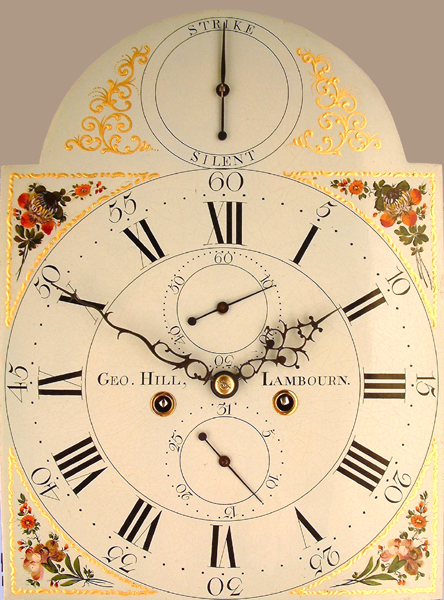 12" breakarch early "Wilson" painted dial with strike/silent to arch subsidiary seconds and date dials, raised gesso borders to flower painted corner spandrels. Blued cut steel hands. High quality 5 pillar movement with hourly ( rack) striking and strike/silent facility. Exceptional quality for a "country" maker at this period. Geo ( George ) Hill of Lambourn recorded "about 1770". 76.5" ( 194.5 cms. ).